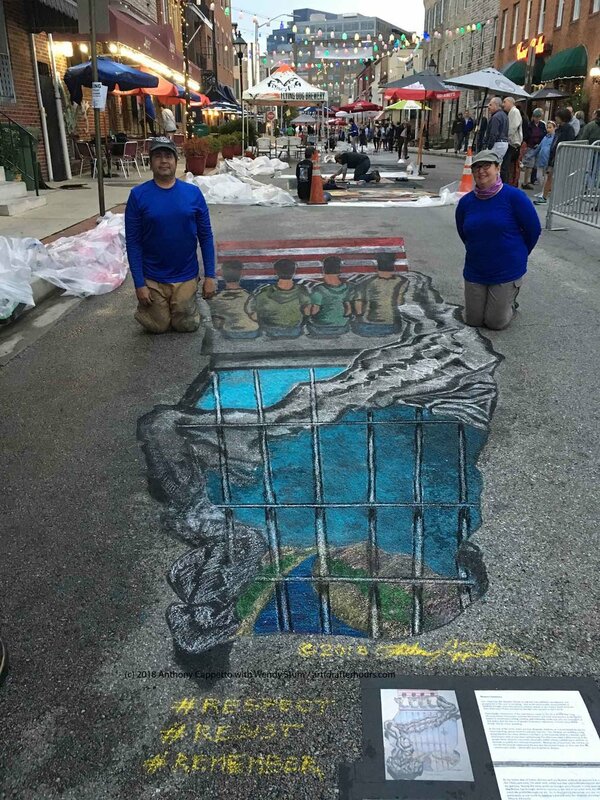 ‘Respect Existence’, was a 3D street art installation completed in Baltimore MD to call attention to the children of parents and family members seeking asylum in the United States but being held in detention facilities similar in principle to the internment camps holding Japanese, Italian, and German Americans during World War II. 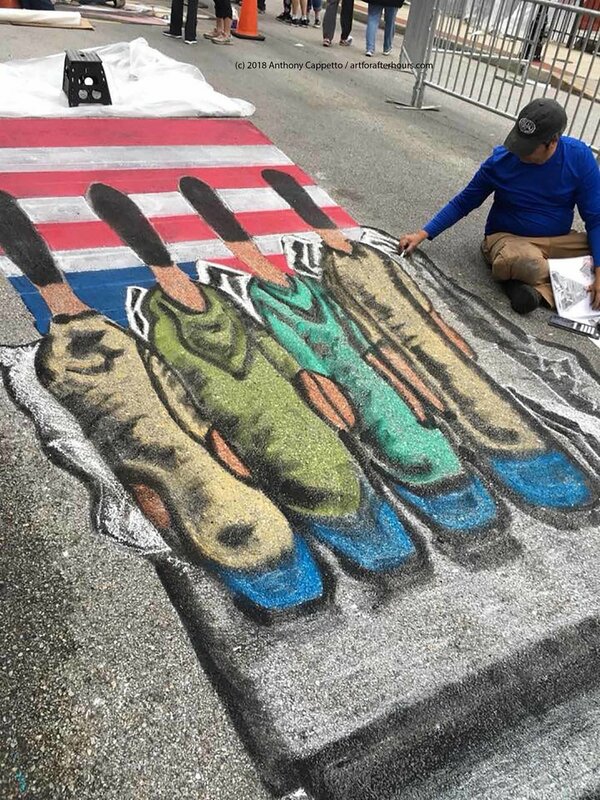 (above) 3D street painting artist Anthony Cappetto working on figures of four detained children of parents/family seeking asylum. 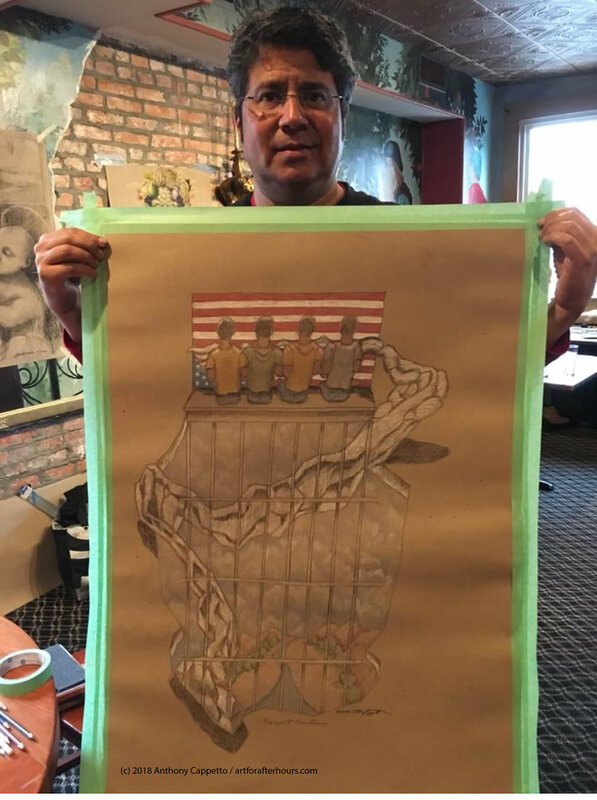 Original sketch of ‘Respect Existence’ by Anthony Cappetto of Art for After Hours. Artists Anthony Cappetto and Wendy Stum facing with the drawn children in solidarity. Above in the work, one sees the four children detained on a metal bench facing the US Flag, upside down, indicating distress. Each child is holding part of a mylar blanket issued to keep them warm, draped over a landscape at the Rio Grande between Mexico and the United States separated from freedom by prison bars. Beyond the prison bars is a Trump Wall free world with freedom and fairness for all, typically the policy of our Nation of Immigrants. 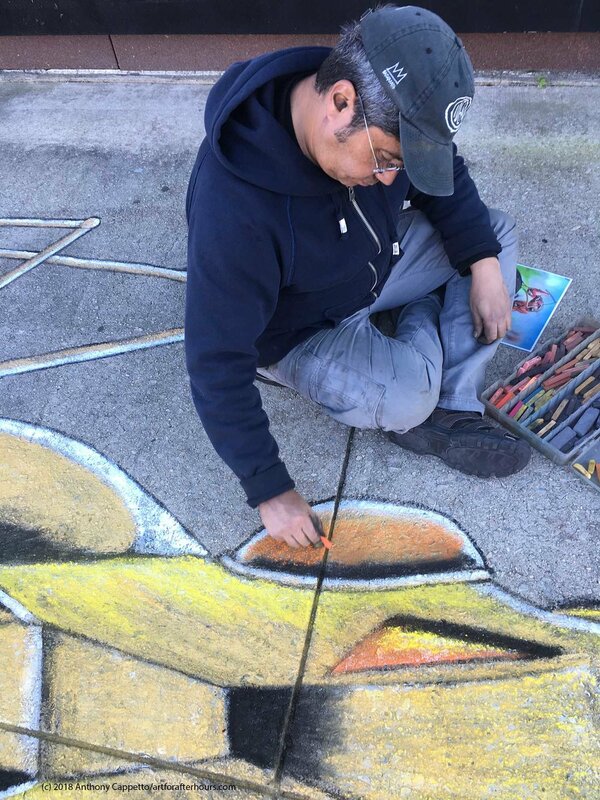 Prior to our live 3D street painting project, we were developing a 4D animated augmented reality component positioning animated children holding placards of #Respect and #Remember while an ICE guard was programmed to walk menacingly at the base of the art. Our first 3D street painting of 2018, 'Fire Snake in Glass Blocks' for Entrepreneurs' Organization New York. 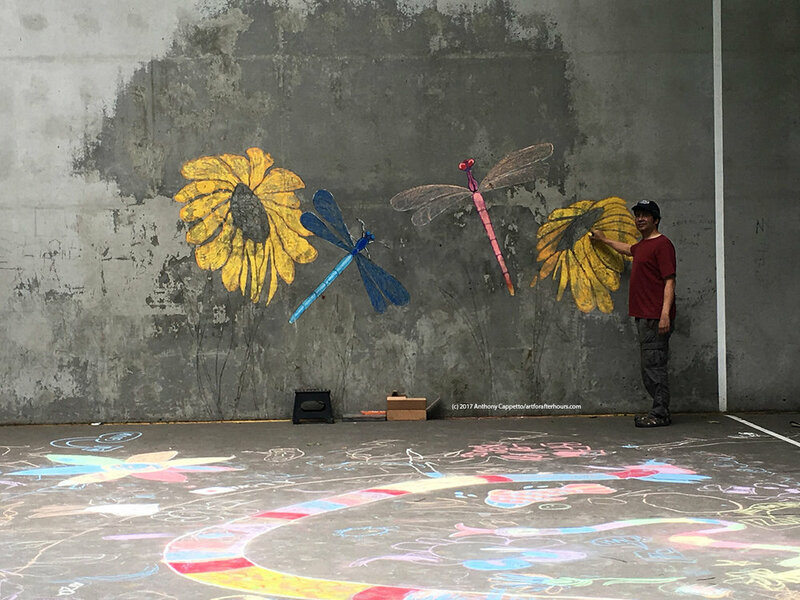 The piece was done in a few hours in chalk for the family event on the West Side of Manhattan in the Hudson Yards area. We were turbo charged to share the 3D piece with many young attendees receiving a positive message of achieving the goals and dreams in a fun, family setting. Like the ongoing development in the area, Art for After Hours looks forward to creating our 3D and 4D concepts using augmented, virtual, and mixed reality for clients in tradeshows, launches and events - large and small. This 3D installation recently completed takes a serious turn to show 3D street art's ability to bring a message to its viewers. 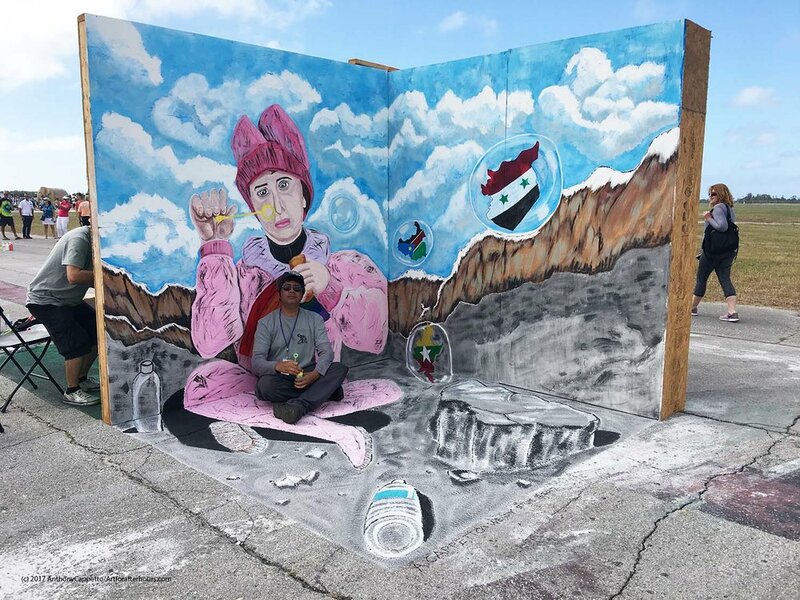 Art for After Hours 3D street artist Anthony Cappetto with Wendy Stum created the art at the Sarasota Chalk Festival in Venice, Florida this year as we have been regular participants since 2010 with many 3D exhibition works. This one was more important to us in its message and delivery. This is a video clip we did during the event in which Cappetto is blowing bubbles in solidarity with our refugee girl whom an aid worker had given a bottle of soap bubbles to entertain her for a few moments, taking her away from the stark conditions around her. In the spirit of the Sarasota Chalk Festival's 2017 theme of Evanescence, we present the story of a refugee child. Amidst the rubble and desolation of a stop on her journey, she blows bubbles representing some of the nations with the most dramatic refugee crises. We selected South Sudan, Syria, and Myanmar (Burma). As a child, enjoying for the briefest of moments - a chance to be a child while sharing a message with the viewers. We the viewers hear and read about refugees' plights, but our thoughts move past them as we put down the information and move on with our lives. They are 'here but not here...'. 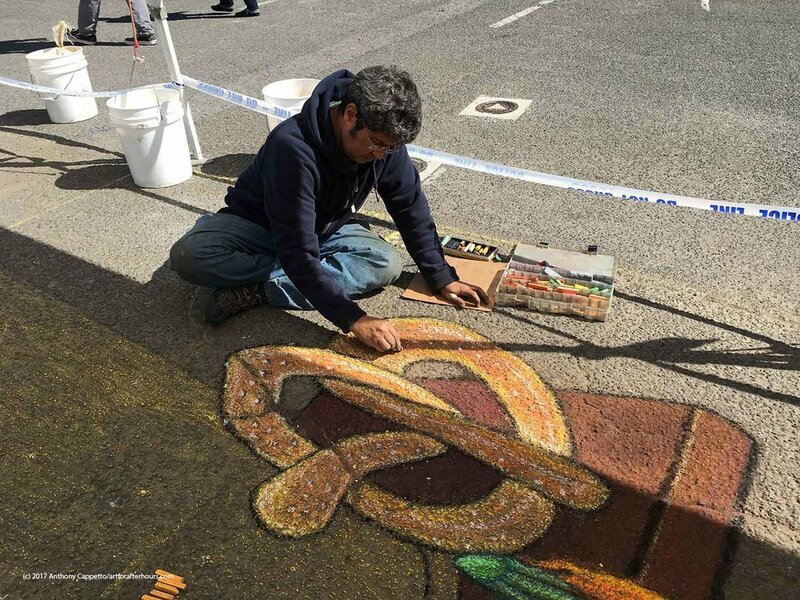 Anthony Cappetto is an internationally recognized 3D street artist working in chalk, paints, to create thoughtful, conceptual works across the world. Founder of Art for After Hours in 2001, the first professional company designing and creating 3D street painting and mural art for corporate, festival, tradeshows, and exhibitions. Cappetto has brought his work to projects in the United Kingdom, Europe, UAE, India, Japan, Uruguay, Mexico, and across the USA. Cappetto is also an Early Adopter of Immersive and Emerging Technologies such as augmented and virtual reality (4D) as part of his 3D street art installations in the USA and India. 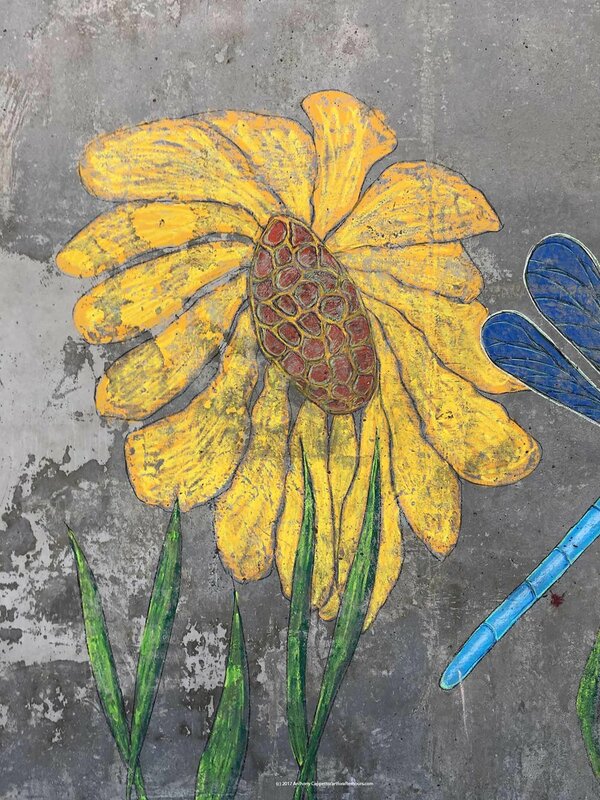 Wendy Stum is Marketing Director of Art for After Hours, an avid member of the street painting art industry, and assist with projects such as these. See more about us on our About page on the Art for After Hours site. 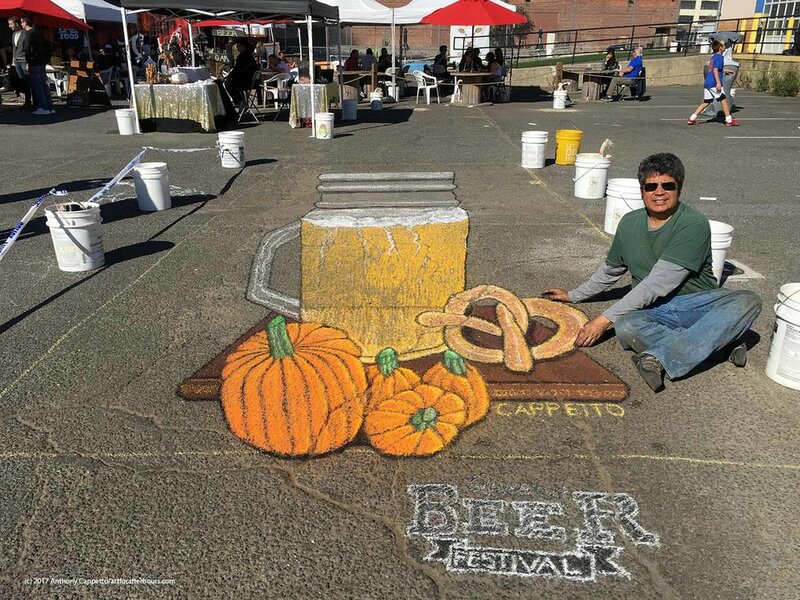 We were brought in by LIC Flea & Food to bring the 3D chalk art experience to the Long Island City community as part of the Queens Beer Festival. 3D chalk art in the early going... We are big fans of creating our designs live and by hand. For us the art is in the full execution of the work especially for live events as a tool to bring the public into the creation of the art itself. A daytime picture of the 3D art as completed at the Beer Festival. A reverse angle of the same art work where you can see the anamorphic 3D illusion effect. The proportions change dramatically to get the 3D result actually drawn in 2D. 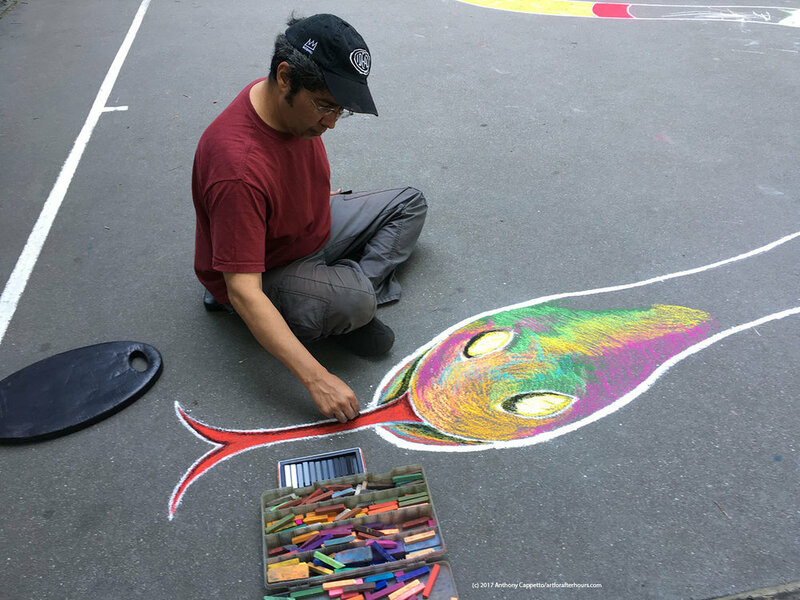 Whether around the world, around the USA, or in our hometown here in NYC, LICtalk to Anthony Cappetto at Art for After Hours for your next 3D chalk/street art concept. I had the pleasure this month to be invited to participate in 'Part of Antwerp', an international art festival as one of a group of top street artists creating 3D street painting at indoor and outdoor locations along the Port of Antwerp. I was the sole American artist participating at the Festival. This is my 3D street art piece - 'A Puzzling Reality...'. This piece in its concept uses a motif of fading imagery and approach starting with the puzzle itself. 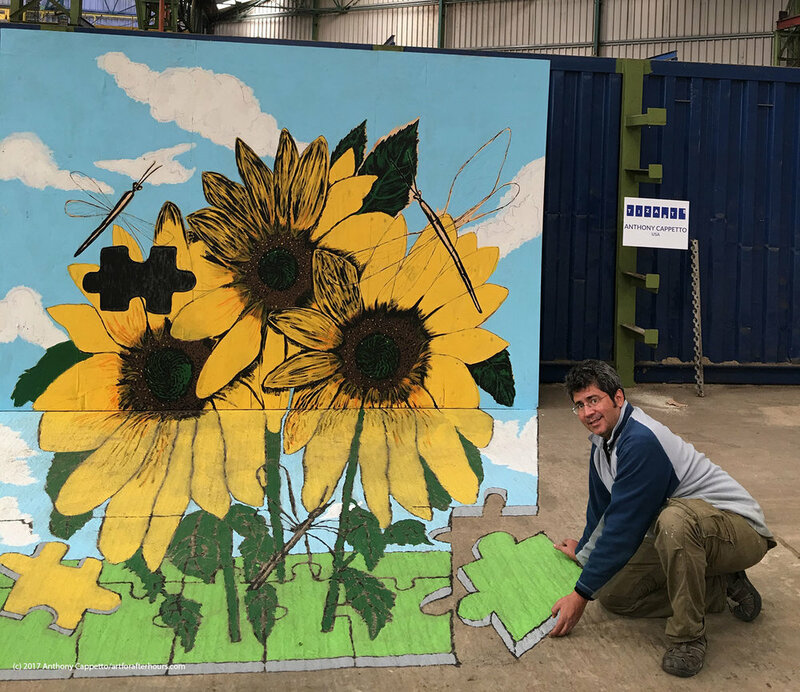 Viewers noticed a puzzle piece that had fallen out of the vertical panel which is actually the 'real' of the group of sunflowers in a field with dragon flies under a blue sky with clouds. The puzzle piece at left falls onto the puzzle on the ground area in front of the vertical while I pick up another piece to put into place. The puzzle itself fades away into reality in a similar way to different drawn aspects of the art themselves fading from completion such as the sunflowers, leaves in higher detail radiating from the seed centers to the grass at the bottom front of the 3D illusion. The dragon flies, drawn from the standpoint of a graphic complete the connection of the art as a cohesive 3D anamorphic illusion by Cappetto. 3D Street Artist Anthony Cappetto (USA) interviewed by ATV.be as part of artist ensemble at Part of Antwerp Art Festival - September 2017. Thank you to my hosts, Part of Antwerp, the Add More Colors Agency, Nele, and the full team who made our artist experience exciting, fun, and fulfilling! 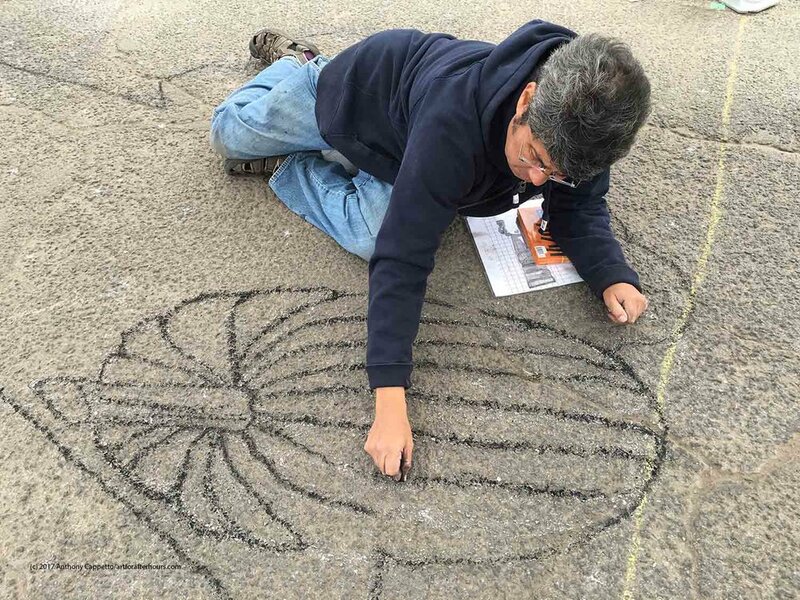 August began a string of new, exciting projects for Art for After Hours starting with a whirlwind trip to the friendly town of Crewe, England where we participated in the 'Chalk it Up' Festival. 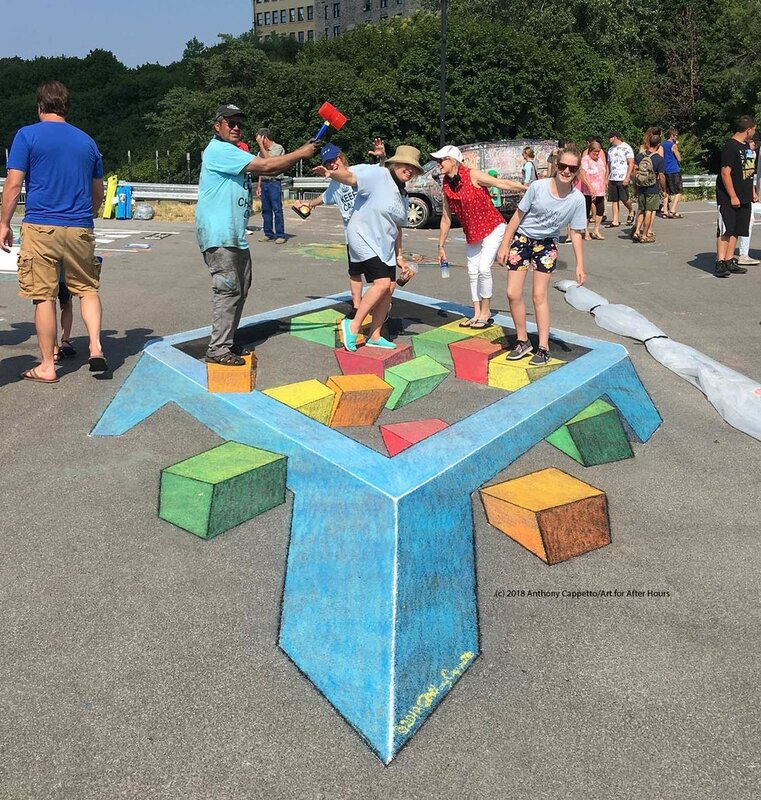 And at the end of the Festival, completed 'Betta Fish Kite', a 3D street painting by Anthony Cappetto of Art for After Hours. 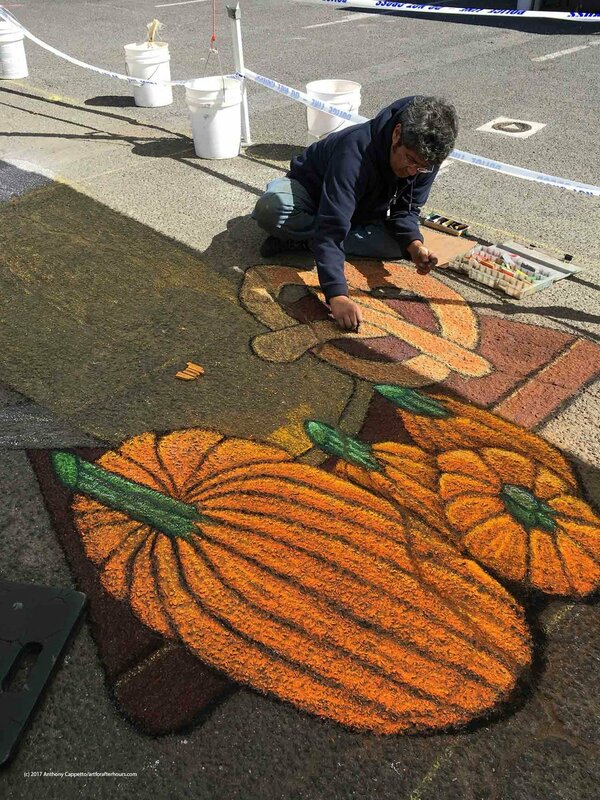 The art measures 12 feet wide, 16 feet deep, took two days to complete. 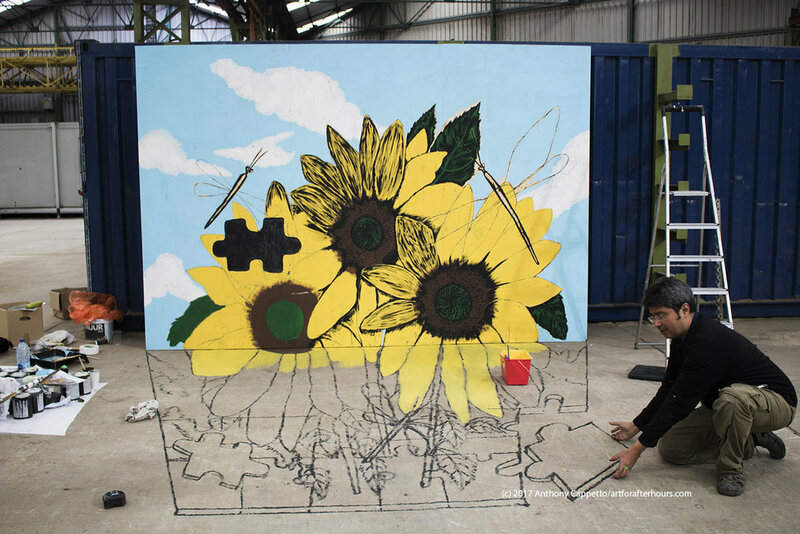 Street Art comes in all sizes, concepts, 2D, 3D, and 4D all according to the concepts of the artist and of the clients we work with here at Art for After Hours. Check out our appearance at the first Community Field Day Event for the Battery Park Community in New York City on June 30th. 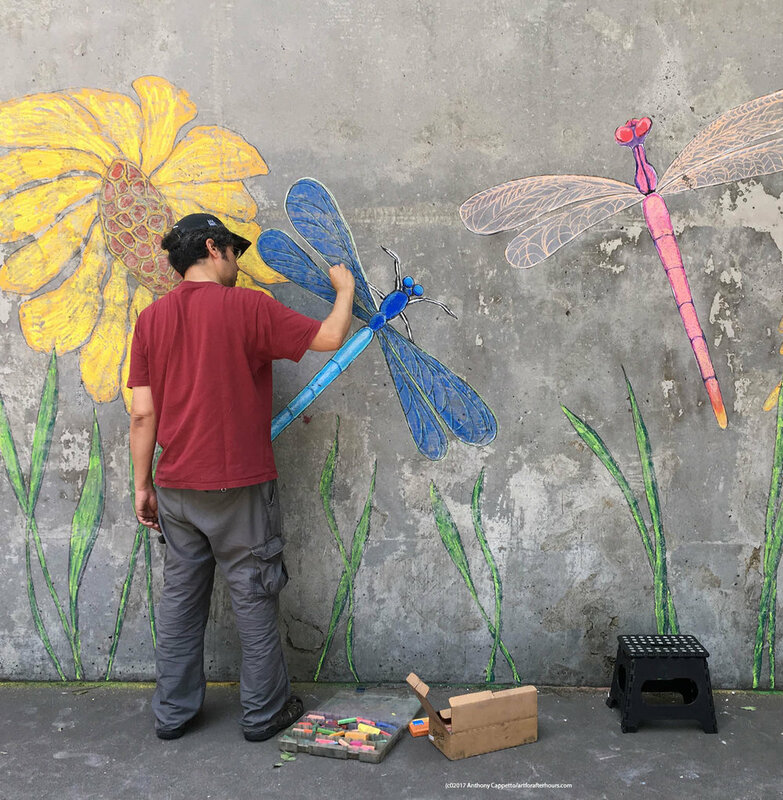 Anthony Cappetto of Art for After Hours with the project 'Dragon Flies and Sunflowers', a street art installation as part of Community Field Day in Battery Park in New York City. July 2017. 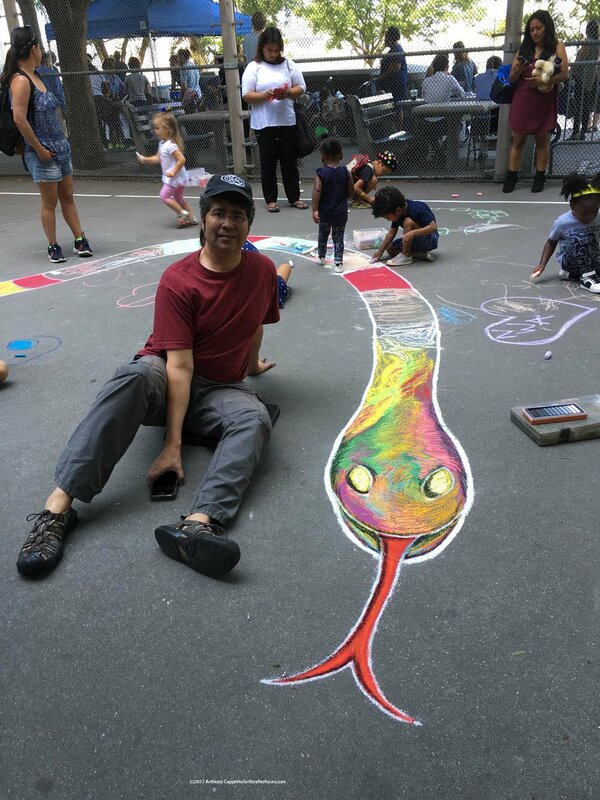 Anthony Cappetto posing for a picture with the head of the snake just before the kids descended upon the pavement which of course was the purpose of the pavement portion for this project! 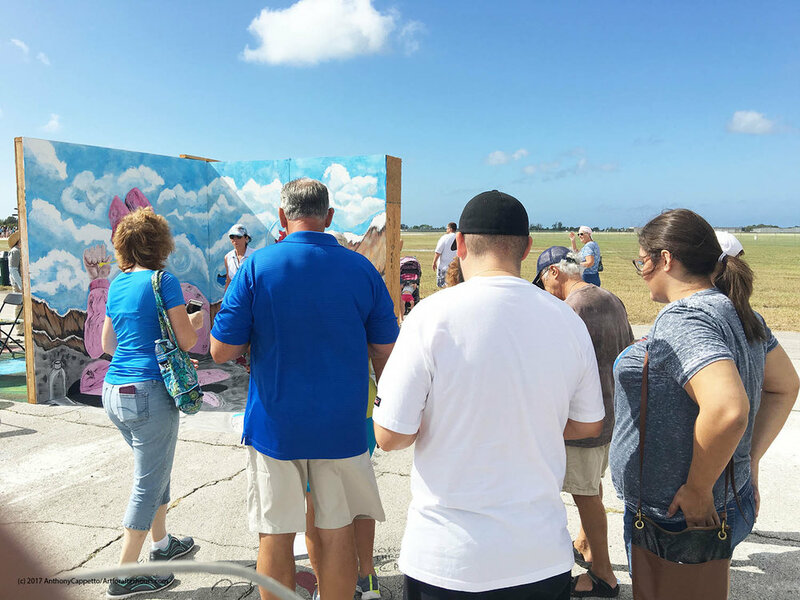 We find creating and sharing our creativity in street art exciting in the large conceptual projects and rewarding especially when we can share with the community; bringing the art experience to viewers and participants, young and older. Especially in New York City where we live as well as across the US and around the world. Talk to us at Art for After Hours and let's see where we can bring the street art out together. Virtual Reality (VR): Walkthroughs, demos, immersive events. All 4D tied in with our 3D murals, floor, walls. Monitor screen grab of AR in action! 3D floor and wall mural done live at major festival in Venice, Florida. Wendy Stum viewing 4D with public seeing the mix of traditional 3D illusion with 4D emerging technologies in Art for After Hours 4D immersive installtion. 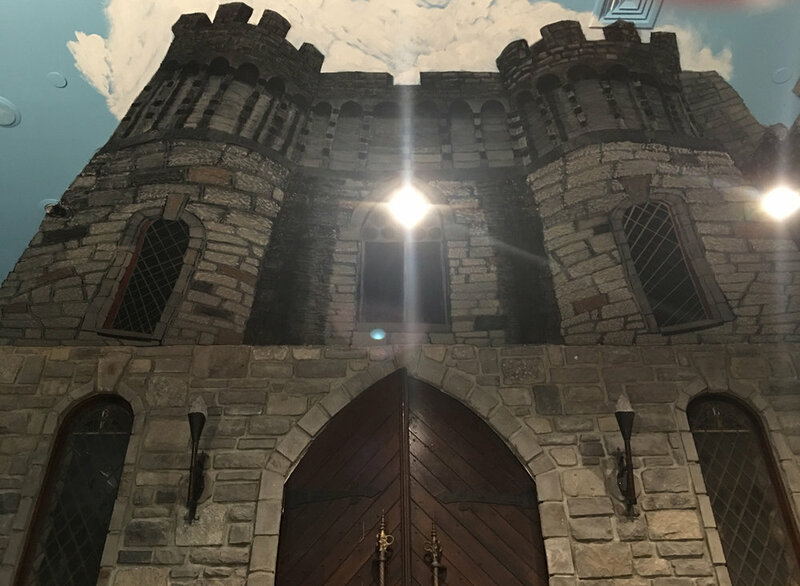 Over 2,000 people passed through this 4D immersive installation for the experience of art/tech together as one cohesive illusion by Anthony Cappetto and Art for After Hours. 3D Install (1 of 2 pieces...); Big 5 Construction Tradeshow in Dubai, U.A.E. 3D mural floor, wall as one total illusion: #dubaicanvas Dubai, U.A.E.